While Kerala Is Under Flood Waters The Right Wing Is Spewing Venom! Kerala is reeling under the worst ever floods in its history. Since this is state that has a long sea coast and many rivers the unprecedented flooding has damaged the whole economy of the State. Hundreds of people died, thousands of cattle died. Several thousands of people are trapped in the inaccessible flood waters. When I enquired from friends living in different parts of the state they say that Centre’s help is meager. The Prime Minister visited the state on 18 August , 20018 and promised just 500 crore help, whereas the neighboring state of Karnataka gave 200 crore help. So far sufficient military and paramilitary forces has not reached reached the state to rescue the people. This is unfortunate. Is it because the Kerala State is being ruled by the Left Democratic Front? Some right-wing networks started tweeting that because of the stand of the State Government’s on Ayyappa Temple issue or because of the appointment of Dalit priests the flood have come. If that is so why the floods in Assam last year where the BJP is ruling now? Why were there floods in Gujarat , which is the state of the Prime Minister?? Is it because of their approach towards the migrant Muslims in Assam or because of Anti-Dalit politics in Gujarat? Why was the Centre so generous to those states where the natural calamity was not of the same magnitude? Kerala is great tourist spot of India and it is known as God’s own country. The indifference of the Central Government is being watched by the whole world that loves Kerala and the global lovers of Kerala want it to be recovered as soon as possible. The Kerala society is though vibrant and plural how can it help itself out of this massive calamity unless a massive central aid flows and international aid flows? “If there is even one in a million chance of a link between the case (on Ayyappa temple and women) and the rains, people — repeat people — would not like the case decided against Ayappan. It is about people’s belief”. But he must know the whole Chennai city in which he lives got inundated a few years back. Is it because he was living in that city with such superstitious politics? Did God punish the whole of Chennai people because of such few people who believe in such superstitions and not in Periyar’s politics? How can people do silly politics over natural calamity and death and destruction? Is the central Government is indifferent because of such opinions coming from these kind of people ? 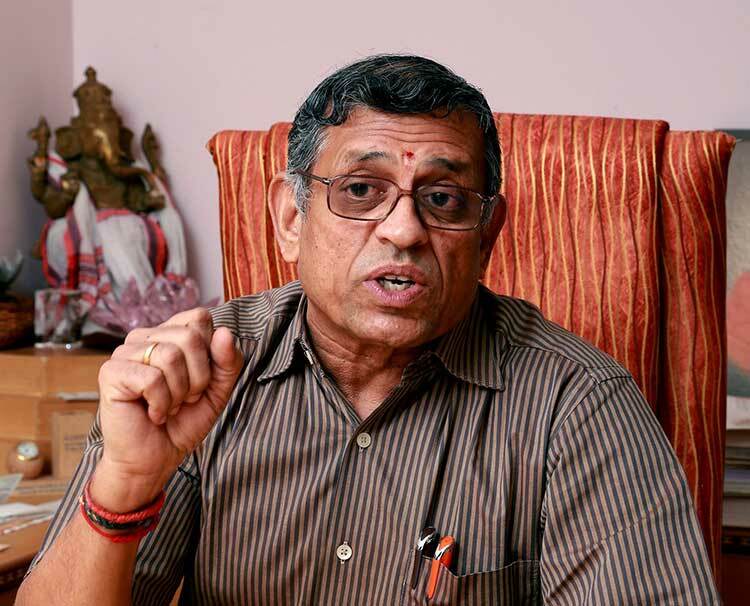 Mind you, Gurumurthy is not just a Sanghi but also a director of Reserve Bank of India! Kerala is known as God’s Own Country for being located where it is. Its geographic location created problem to its people occasionally too. People who are located in drought affected regions like Telangana or Vidharbha also suffer . One of the most beautiful cities in the country is Vishakhaptnam and in 2014 it suffered one of the worst floods and winds. No sensible human being links such disasters to the ideology of the ruling party or person or superstition. Such calamities must be handled with scientific approach. When Vishakhaptaman got flooded the BJP was a ruling partner and Chandrababu Naidua as their comrade- in –Arms was ruling the state. Now of course the situation changed and he is their enemy number one and there are no floods in Andhra Pradesh. The Hindutva forces must know that drought, earth quakes and floods are natural calamities and they have no ideology. When the Saurastra region of Gujarat had worst earthquake and the whole masses lost everything why their God did it that way? The worst part was the international funds at that time rushed for rehabilitation were used for the propaganda and network building of the Sangha Parwar networks! The London based organizations located this misuse of the funds. If the Left wing organizations misuse the funds coming for flood victims we must oppose. But deploying ideological negativism on such occasions is nothing but anti-nationalism. I strongly appeal to the national and international organizations to rush to the help of Kerala flood victims– humans, cattle and institutions– and help the state. The Central Government must stop playing politics and extend every help as it is a national calamity and declare Kerala Flood situation a national calamity. I appeal to all the International Aid Agencies to help the Kerala people in this hour of death and suffering.